Two 900 liter AI tanks for petrol and oil (used as well for contaminated liquids) and a 900 liter AIII tank for diesel is placed on the platform. Furthermore you also find two 750 liter AIII tanks for coolant and washer fluid on this device. The big advantage of this system is the mobility. Thanks to special stacker holes the platform can be easily positioned at any desired location. The big issue of storing fluids relating to the de-pollution of ELVs is done with this SEDA solution in a very professional and simple way. 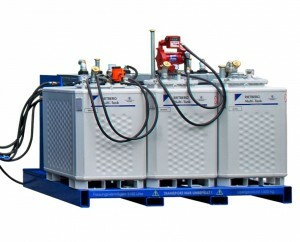 The TankPlatform was designed together with the SEDA MDS6 container. For this reason it is possible to place the platform in the container for transport. A special fixing device helps to prevent a movement of the Tank-Platform while transportation.